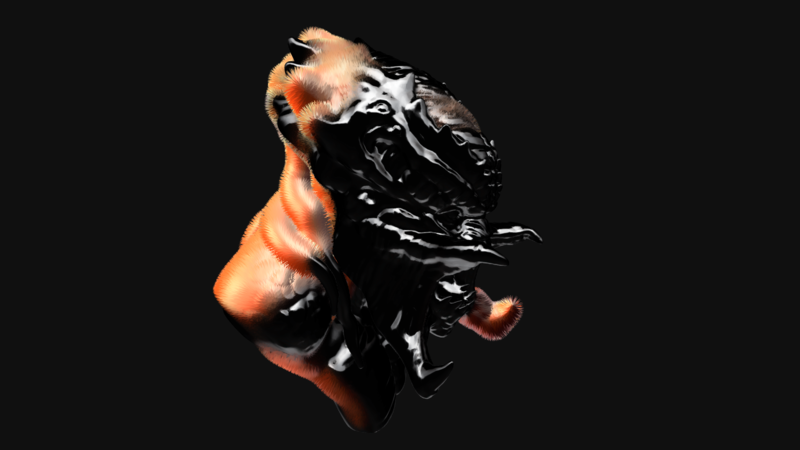 Fluffy predator with THREE.js & instanced geometry – Youpi ! For a recent project I had to manipulate a potentially large number of meshes. I chose to use THREE.InstancedBufferGeometry as it is very efficient ; it allows to draw the same mesh many times, with different attributes, in a single drawcall. Working with instances is slightly different from using regular meshes. In a nutshell, you give the blueprint of the mesh you want to draw, adding attributes as you would with a THREE.Buffergeometry and set some special THREE.InstancedBufferAttribute that will affect each instance of the blueprint. If you understand the concept of blueprint (the actual geometry), instance (the placeholder for a blueprint) and InstancedBufferAttributes (the variables applied to each instance of the blueprint), you’re good to go. The big difference with regular meshes is that instead of setting the meshes’ translation/rotation/scale (TRS for short) directly on the mesh object, you have to either, manipulate all the instances’ BufferAttributes on the CPU then re-upload them to the GPU or perform procedural transforms directly on the vertex shader. There is a limitation when using Instances ; in WebGL, you can’t pass more than 4 floats per attribute. This may not sound like much but it has a big impact on how you manipulate the meshes. You can’t pass a Matrix4 (4*4 floats) to transform an instance. This was a surprise for me, a Matrix4 is the way meshes’ store their transformations internally, it would be convenient to pass the elements of a matrix and use this matrix InstancedAttribute it to transform each instance of the blueprint but it is not technically feasible. //we can add more ; normals and uvs are very often used to shade the mesh. //now for the InstancedBufferAttributes, what makes each instance different. Then I tried to assign uvs as InstancedBufferAttributes (related to each instance) rather than BufferAttributes (related to the blueprint). Each instance now has it’s own uvs instead of using the blueprint‘s uvs. where ratio is a value between 0 and 1. When the ratio is 0, the instance is in the original position, when the ratio is 1, it is in the target position, if ratio is between 0 and 1, the values are interpolated between the 2. The ratio can be passed as an InstancedBufferAttribute so that each instance opens gradually and/or with a delay and of course, the ratio can be a noise function to get fancy animations. The next natural step for me was to try to cover a mesh with instances of triangles so that any mesh with a triangular basis would fit nicely and wrap the distribution mesh. The source triangle should be scaled, skewed, rotated and translated so that a single matrix can transform it into any triangle in space. Little did I know that aligning a triangle to another triangle using a transform matrix requires a special type of transform called an affine transform (I couldn’t explain the difference between homothetic and affine really). When life gives you affine transforms, run. now t contains transform from our source triangle to the current face. I thought it would work but nope! In fact, I obtained a completely valid Matrix4 but, as we need to decompose the Matrix4 into the T,R & S components to pass them as attributes to the GPU, I suspect some data, required for the affine transform, went missing. In other words, it got schwifty and the triangles wouldn’t fit. After some further research, I found this StackOverflow thread explaining how to pass a Matrix4 as 4 vec4, then recompose it on the vertex shader. I followed the example and got it to work. And there you have it: a fluffy Predator! the HI-RES mesh is fairly big (250K faces, 8Mo) so it may turn your computer into a toaster. But your function is probably much more optimised. I don’t know if this TRS transform is very different from your function (apart from the fact that it adds Translation and Scale :)) or if it is more efficient (it depends on whether or not the cross product is hardware accelerated) but it’s simpler to read and write. Every glsl-functions is optimized compared to those you write by yourself, thats why I said yours is probably more efficient. so for the uvs, you need to pass a scale and offset attribute to each instance ; the scale will ‘crop’ a portion of the texture – say you have a 4 * 3 grid, your scale will be 1/4 on the X axis and 1/3 on the Y axis – and the offset will tell which cell of the ‘grid’ you want to display – again with a 4 * 3 grid, to get the bottom right corner, the offset should be 3 * 1/4 = .75 / 2 * 1/3 = .66.
then in the vertex shader, you compute the uvs like so: vUv = uv * scale + offset; and you’ll probably need to flip the Y axis so adding a vUv.y = 1. - vUv.y; could help. And huge thanks for the reply! I might have missed something, could you ellaborate on the formula you mentioned? and also, should I pass the blueprint geometry’s UV’s, or should I, as you mentioned in the article, create an instanced bufferattribute and assign UV coordinates by hand? If so, I tried doing that and it worked when I assigned the array as a buffer attribute, but when I used the same array as an instanced bufferattribute, my meshes are getting different colors that are similar to the image that I use as a texture!